Since its opening in 1954, the Crematorium has seen a number of babies/children find their final resting place within its memorial gardens, but it always lacked a designated area for families who experienced the loss of a child. Head Gardener, James New, has spent the last 5 years re-developing the 11.5 acre site, and wanted a fitting area for this purpose in the space available. He wanted to create something a bit more original, yet still meaningful for those families who would be visiting. The theme would be that of Peter Pan with the main focal point being a stained glass window. The window would depict a painting called ‘Peter’s Friends’ by the Victorian artist Margaret Tarrant. Around the two side walls of the garden there would be raised planters with benches set back into them. Topiary balls, spirals and cones would be permanent features and seasonal bedding inter-planted for additional colour. 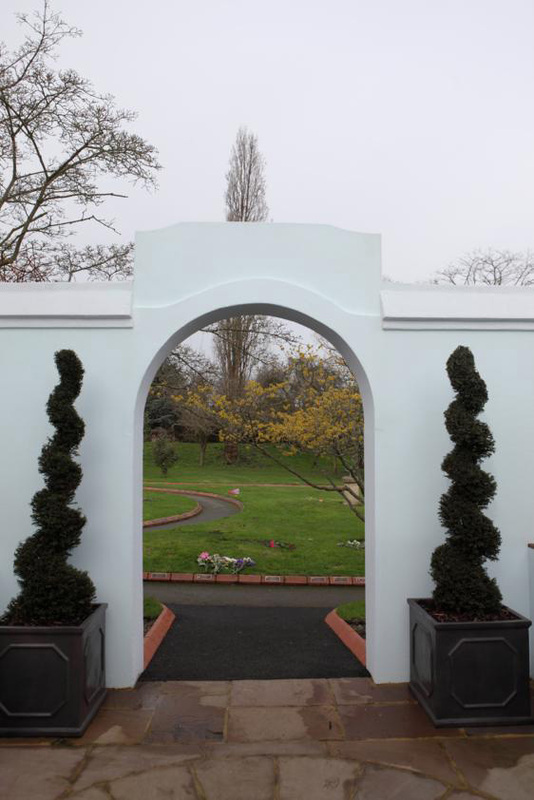 This was not a project that could be accomplished on a small budget, and the initial funds of £12,000 were raised through the efforts of the crematorium staff, donations from funeral directors, trade suppliers and visitors to the crematorium, with a substantial donation added by the crematorium Board. 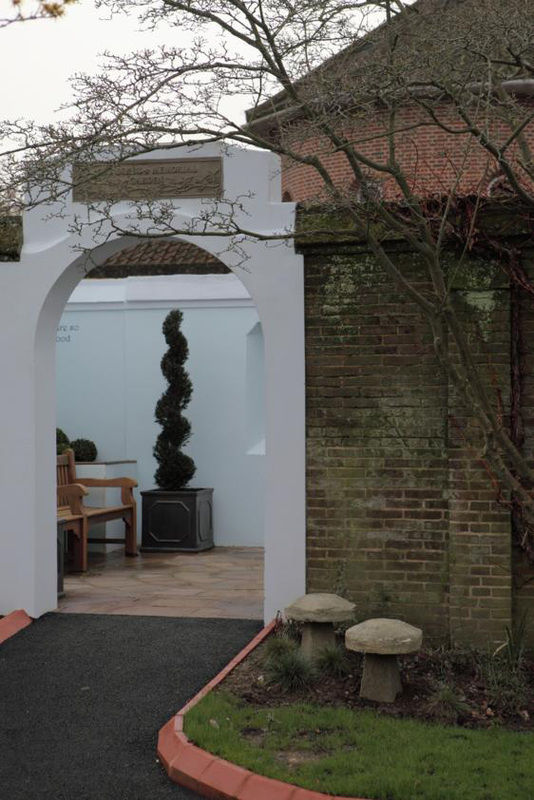 During the building of the garden The Co-operative Funeral Directors branch at Whitton arranged for the donation of the stone sign for the arched entrance into the Children’s Memorial Garden free of charge. 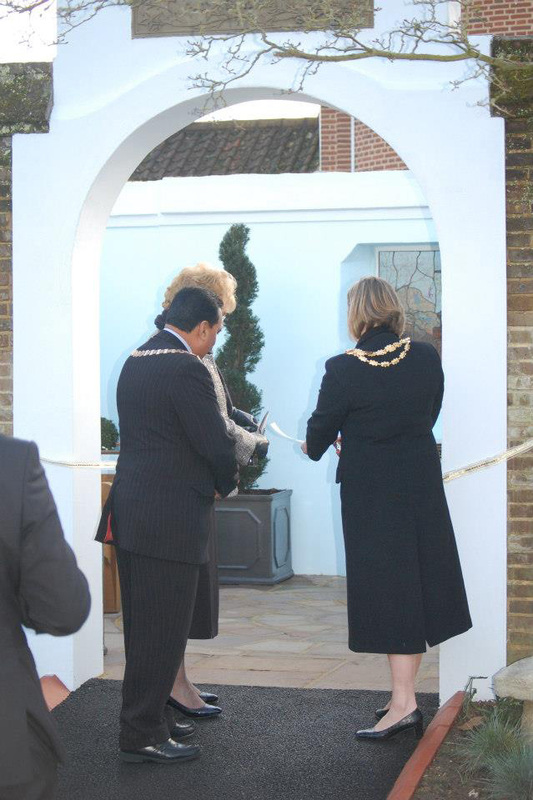 Saturday 8th December, 2012, saw the official opening of the Children’s Memorial Garden. 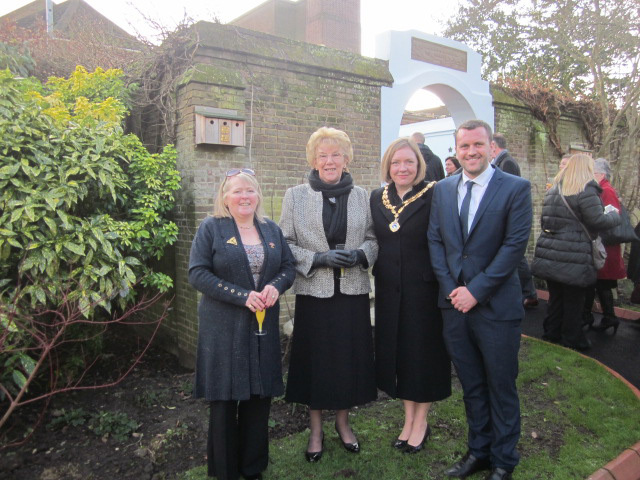 Teresa Kearney, The Superintendent/Registrar of the crematorium, opened the ceremony by extending grateful thanks to everyone for coming, and introduced The Chairman to the Board, Councillor Denise Grant of Spelthorne Council, Natasha Bradshaw, President of the Institute of Cemetery and Crematorium Management (ICCM), for officially opening the Garden, ably assisted by the Mayor of Hounslow Mayor Cllr Pritam Grewal. After the official cutting of the gold ribbon, with garden topiary shears, Councillor Grant spoke of her 20 year involvement with the crematorium. She expressed her thanks to all the staff for their hard work and commitment, and her grateful thanks for the monumental changes that have taken place in recent years. She stressed how everyone works as a “team” to provide a first class service to all the communities they serve, and has been proud to have been the chairman during this period of transformation. Natasha Bradshaw, President of the ICCM, who, in the past, has been Clerk to the Crematorium Board, spoke of her gratitude to the Board and staff in adopting the ICCM Charter for the Bereaved. 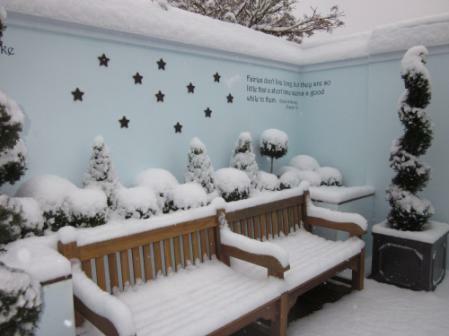 She spoke of her admiration and high regard for the service the crematorium provided, and that the standards set by The South West Middlesex Crematorium are highly respected and used as a benchmark for others, who work within other bereavement services. The construction of the garden was all carried out by local builders who gave their time free of charge – St. Georges plc, Ardmore Builders, Kingston Garden Services. Donations were received from visitors to the crematorium as well as donations from local Funeral directors – Lodge Brothers and the Co-operative in Whitton. 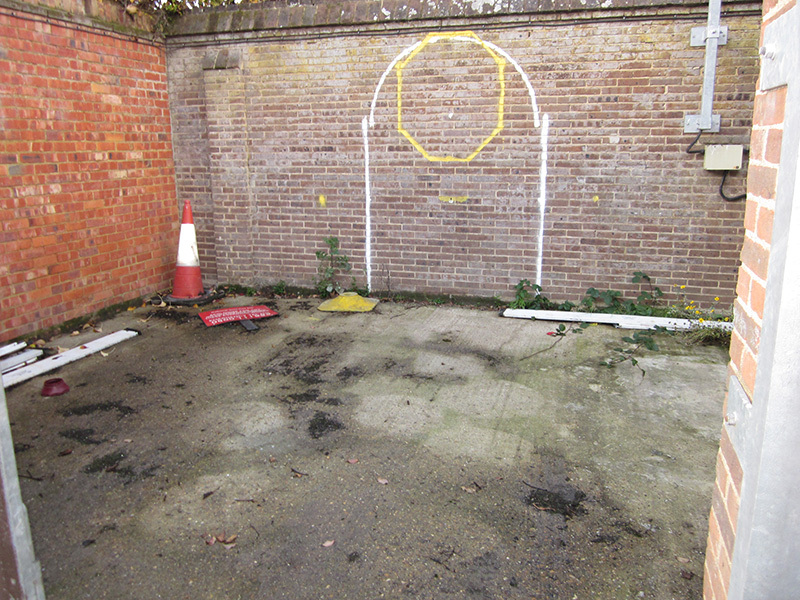 The focal point of the garden – the stained glass window – was created by Coriander Glass of Wimbledon. Jeremy of Coriander Stained Glass said they had reveled at the opportunity to produce such a “unique piece of work” for such a “special project”, which took them 3 months to create. Ian Dobie, St. Georges plc, during the opening ceremony, expressed his own personal thanks in being given the opportunity to be part of the creation of the Memorial Garden, and to Ardmore Builders for their assistance and genuine interest and involvement in the project. 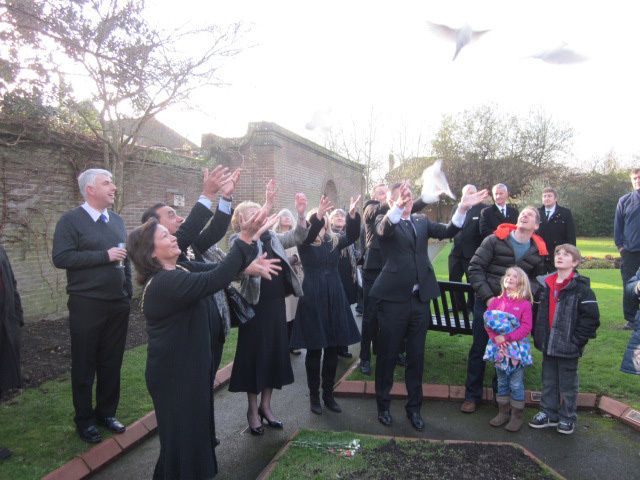 To close the official opening ceremony a toast was raised as a thank you for everyone who had contributed in helping the dream become a reality, and doves were released to commemorate the occasion, and wishes were expressed that all those who visit the garden will gain some peace and solace. 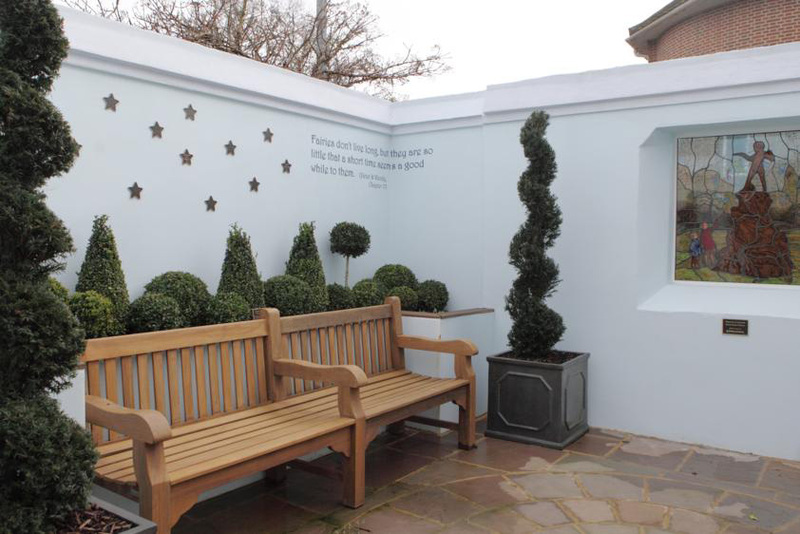 If you wish to sponsor one of the stars that adorn the walls of the garden please visit our memorials page. (Left to Right) Teresa Kearney, Superintendent/Registrar, Councillor Denise Grant, Chairman to The Board, Natasha Bradshaw, President of the ICCM, James New, Head Gardener of the Crematorium outside the Children's Memorial Garden.